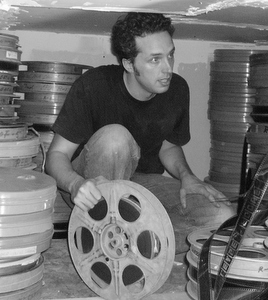 Colin Marshall sits down in the basement of Portland’s Hollywood Theatre with Dan Halsted, head programmer there and founder of the 35mm Shaolin Archive. They discuss fake Bruce Lee films; his adventure of rescuing classic kung-fu film prints, including gems like The Eight Diagram Pole Fighter and The Boxer’s Omen from a shuttered, junkie-surrounded theater in Vancouver; his youth in a distant Oregon town with 600 people, his move to Portland, and his discovery of kung-fu cinema; how much more kung-fu movies offer than the fighting; the advantageous openmindedness of Portland filmgoing culture; exploitation films and Quentin Tarantino’s high-profile love thereof; how different cities react to kung-fu movies, like the robust Chinese turnout in San Francisco or the disappointing attendance in St. Louis; kung-fu movies as a gateway to Chinese culture; 36 Chamber of Shaolin as a gateway to kung-fu movies; the evaporation of celluloid film, and the apparently dramatic shift in the way those under age twenty experience cinema; the various meanings of terms like “exploitation” and “grindhouse,” and how the attendant concepts cannot be separated from the seventies, a time when Hollywood acted serious and independent film acted frivolous; what Portland’s smallness affords a film programmer; why audiences sometimes prefer watching a beaten-up print to a pristine one; how Portland has successfully integrated food and alcohol with filmgoing; his experience getting tased, and how the Portland police force, known for its own aggression, tried to use kung-fu movies against him in court; and his never-ending task of pushing outward the limits of local film taste. This was written by Colin Marshall. Posted on Sunday, December 2, 2012, at 4:45 am. Filed under Notebook on Cities and Culture. Bookmark the permalink. Follow comments here with the RSS feed. Post a comment or leave a trackback.